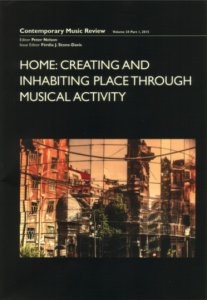 “Home: Creating and Inhabiting Place through Musical Activity”, Contemporary Music Review 34(1) 2015. This special issue explores some of the ways in which music ‘makes sense’ by bringing into focus different types of music and various aspects of musical activity, examining how they relate to ‘home’. Contributions are motivated by two primary concerns: (1) How is home constructed musically? (2) How does the inhabiting of musical homes occur? Resonating with Edward Casey’s understanding of place as an ‘event’ rather than a ‘thing’ (1997), contributions posit musical home variously as place and journey, as bound up with location and yet positioned in between, as constituted through the conjunction of the material and the imaginative. In doing so, authors address how impermanence and changeability relate to the subject’s sense of belonging. They examine the desire to feel at-home and the sense of possession that often accompanies this desire, and consider some of the strategies through which musical places become habitable or uninhabitable.